Daleys Fruit Tree has Plants for Sale to Severnlea and can Mail Order them to you door. Click to Find out how much Freight Will Cost. Jumbo Nut, high yielding. Preferred variety for all markets. It requires cross pollination with the Halls Giant. The tree is moderately vigorous and has few suckers and is an abundant cropper. The shell is moderately firm and light brown with pronounced darker-colored stripes. 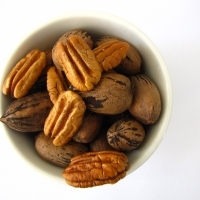 Nuts are large and attractive, averaging 4.2 g, and have a kernel percentage of 48%. Halls Giant is the main pollinator for Ennis. It does not produce a big crop of nuts but it does shed large amounts of pollen late in the season. 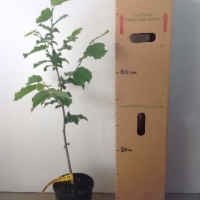 Every planting of hazelnuts should contain at least 20% pollinators. 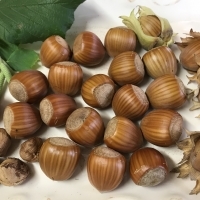 A - SP - Proven variety that produces a large nut with a thick shell. The meaty kernel is of very good quality. Light producer in early years with good production by year 12 when it crops prolifically and consistently.